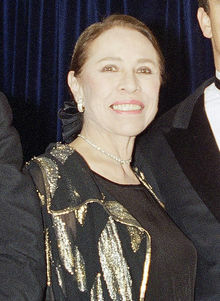 This Oct. 3, 1994 file photo shows former ballerina Maria Tallchief Paschen at the Princess Grace Foundation-USA 11th Annual Princess Grace Awards in New York. Tallchief died Thursday, April 11, 2013, in Chicago at the age of 88. Tallchief joined the company that would become the New York City Ballet in 1948. She was married for a time to George Balanchine, who founded the School of American Ballet in New York. Tallchief worked with Balanchine on such masterpieces as 1949's "Firebird" and his now-historic version of "The Nutcracker."